investigated by several researchers (e.g. Lay and Galambos, 1967; Kato and Akiyama, 1982; Kato, 1989). In subsequent sections, the behaviour of the three ain configurations of steel frame structure, namely moment resisting, concentrically and eccentrically braced frames, is discussed. Whereas moment-frames exhibit relatively ductile behaviour under earthquake loading, their lo lateral stiffness may, in some situations, result in high storey drifts, thus leading to unacceptable damage to non-structural components and possible stability problems. On the other hand, concentrically braced frames may provide relatively higher stiffness, but can often suffer fro reduced ductility once the compression braces buckle. Eccentrically braced frames have the potential of providing adequate ductility as ell as stiffness, provided that the shear or bending links are carefully designed and detailed to ithstand the substantial inelastic demands that are imposed on these dissipative zones. 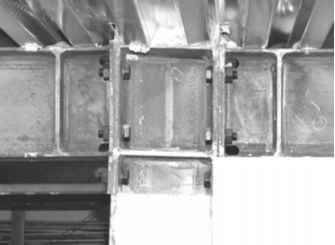 Moment resisting frames (MRFs) are designed such that plastic hinges occur predominantly in beams rather than in columns (weak beam/strong column design) as shown in Figure 6.2. This provides favourable performance, compared to strong beam/weak column behaviour through which significant deformation and second order effects may arise in addition to the likelihood of premature storey collapse mechanisms. 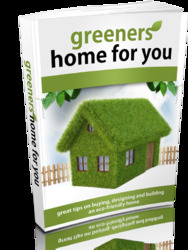 The only exception to this requirement is at the base of the ground floor columns, where plastic hinges may form. EC8. 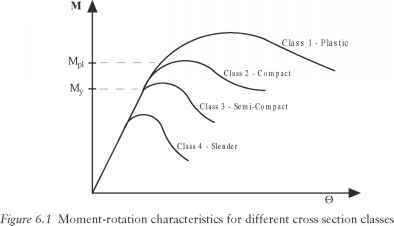 Nevertheless, due to their inherent low stiffness, lateral deformation effects need careful consideration. In EC8, the 'weak beam/strong column' concept is typically required, with plastic hinges allowed at the base of the frame, at the top floor of multistorey frames and for single-storey frames. The most recent version of EC 8 also allows dissipative zones to be located in the connections provided adequate behaviour can be demonstrated. 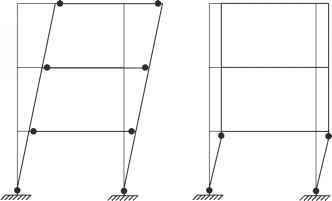 Rules for moment-resisting frames are described mainly in Section 6.6 of EN 1998-1.
the gravity and moment components on the beam, respectively.